Morning walks are the ritual for my sister-in-law, Claire, and her husband, Martin, and from their home in Bowser, British Columbia, on Vancouver Island, they have a variety of options open to them, but no matter which direction they choose to go, they almost always spot one or two Bald Eagles in the treetops. When Bob and I visited with them in early January, it was easy to fall into their routine that required exercising the dogs each morning and again in the afternoon. 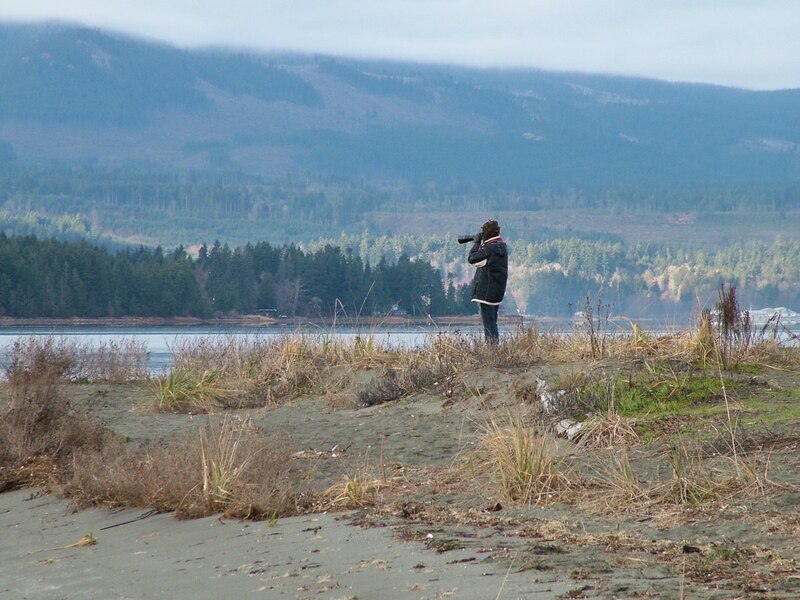 On one such morning, it was suggested that we walk a short distance to the shore of the Salish Sea where it lies between Denman Island and Vancouver Island. It took us all of five minutes to get there. 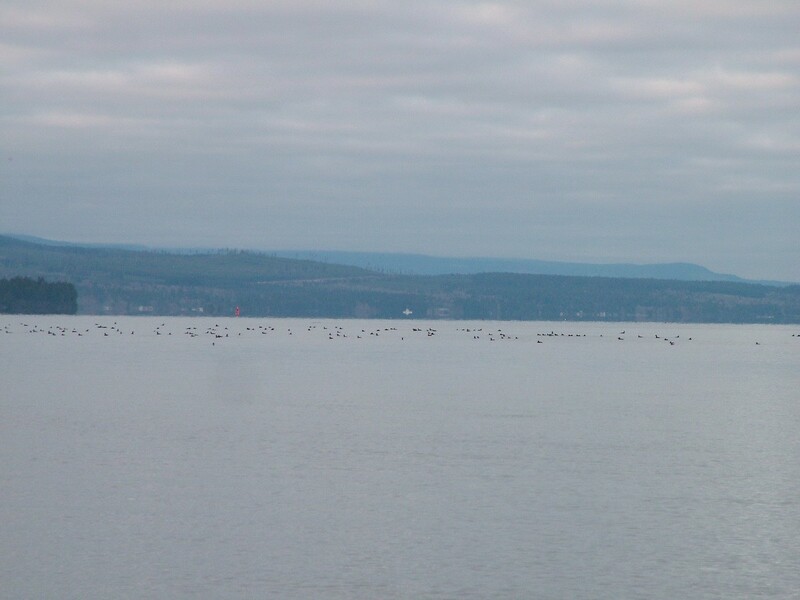 As we strolled along the beach, flocks of ducks bobbed on the smooth water, and a few harp seals could be seen fishing just offshore. It had been a frosty night, and evidence of that was visible on the backside of the peninsula behind which Deep Bay is located. Thin ice covered the sheltered water of the marina. 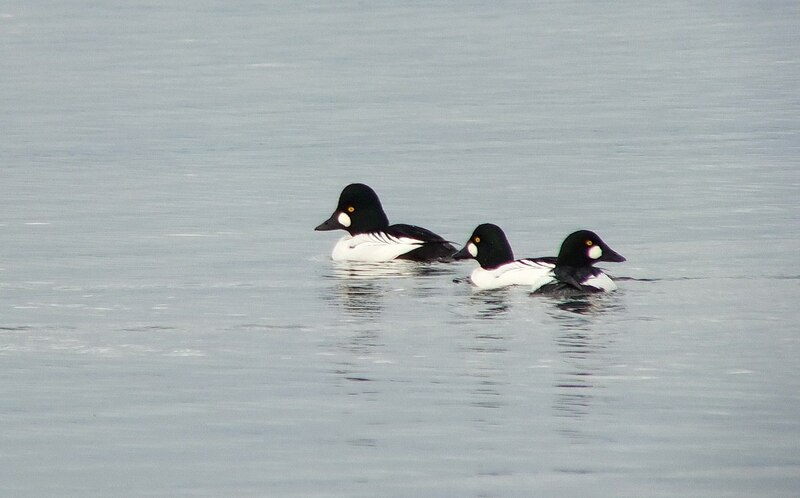 Amongst the collection of waterfowl enjoying the peaceful morning were numerous Common Goldeneye Ducks. These drakes are identifiable by the bright white oval patch on the side of their faces at the base of the bill. My photograph also shows the yellow or golden eyes for which the ducks are named. 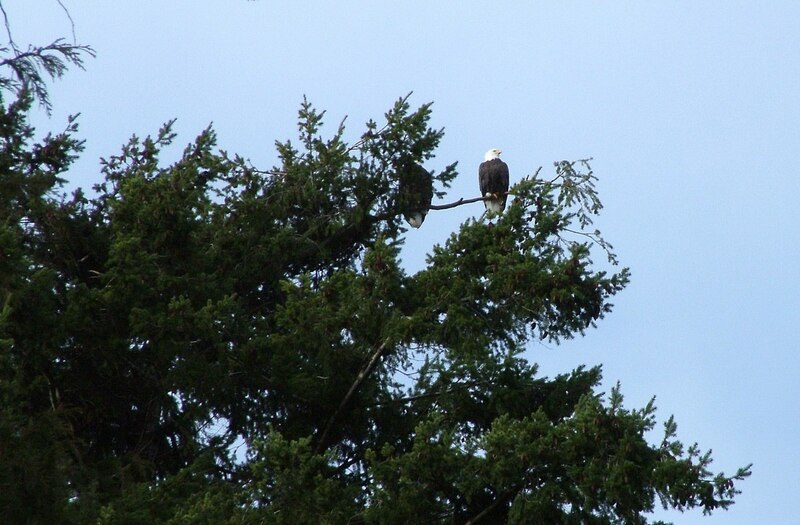 As our small group circled back along Deep Bay Drive, the dogs running rambunctiously ahead of us, we spotted a pair of Bald Eagles perched in the top of a tree, eyes turned towards the sea. The pair, probably a male and its mate, had a regal countenance as they passed the time in quiet observation of their surroundings. 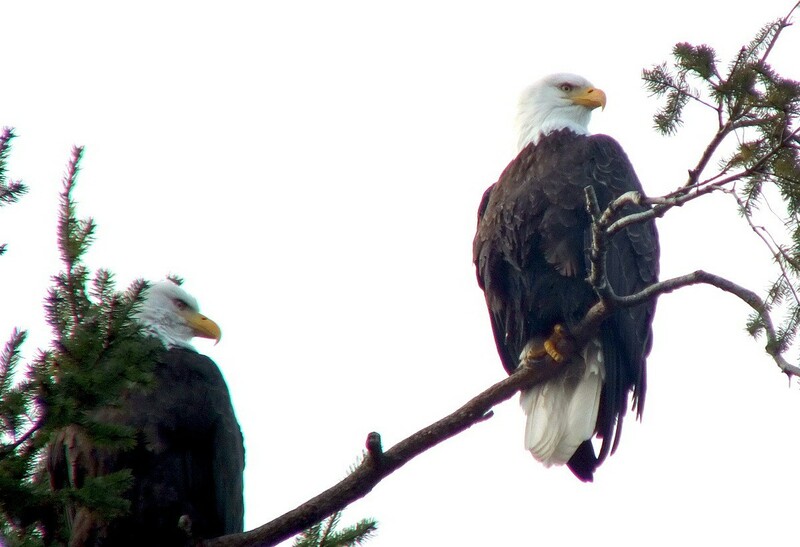 Bald Eagles mate for life, and the average lifespan of a Bald Eagle in the wild is about 20 years. The oldest confirmed Bald Eagle in its natural habitat was 28 years old. 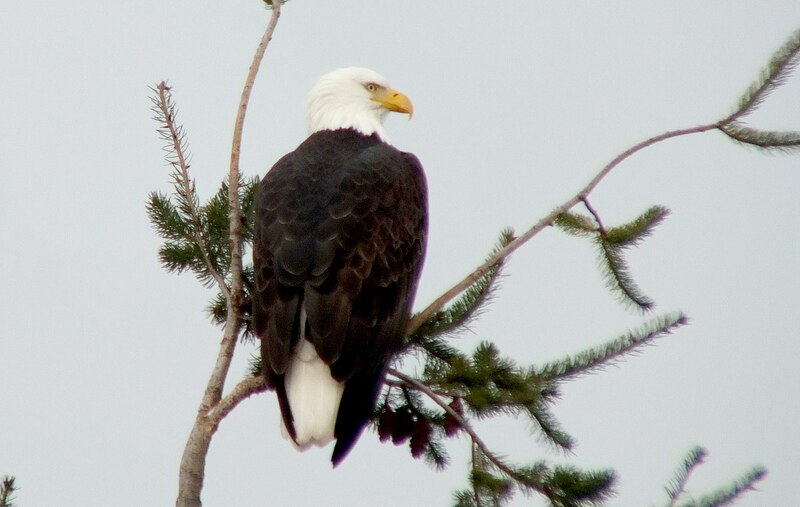 The survival rate of Bald Eagles in the wild depends a great deal on their location and access to prey. In captivity, a Bald Eagle can live almost twice as long. 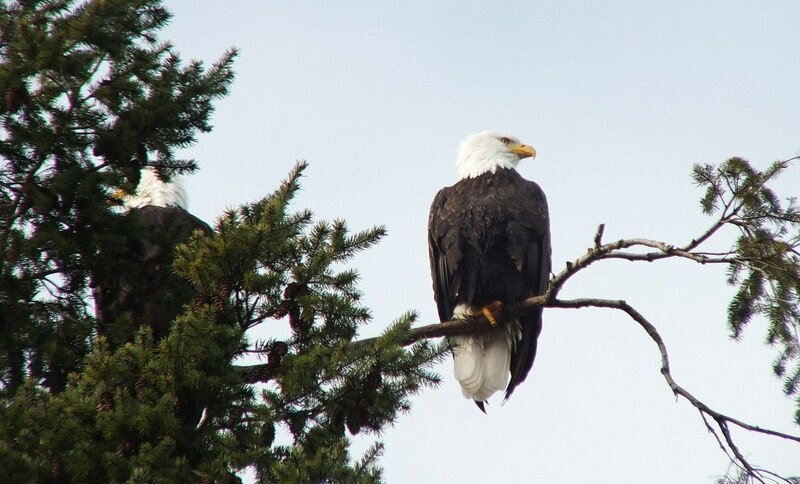 Bob and I were pleased to have a good vantage point of the handsome pair, and his sister, Claire, took delight in the fact that her guests had a chance to see some of the local Eagles. Despite the subdued lighting of an overcast morning, their snowy-feathered heads and white tails gleamed against the pale sky and dark green boughs. The United States of America uses a Bald Eagle as both its national bird and national animal symbol. These powerful birds of prey were not a shoe-in for the job, however. Because they get a lot of their food by stealing kills from other animals, one famous American, Ben Franklin, was opposed to the bird’s nomination as a national symbol. He felt that the bird’s thievery did not promote the right image. 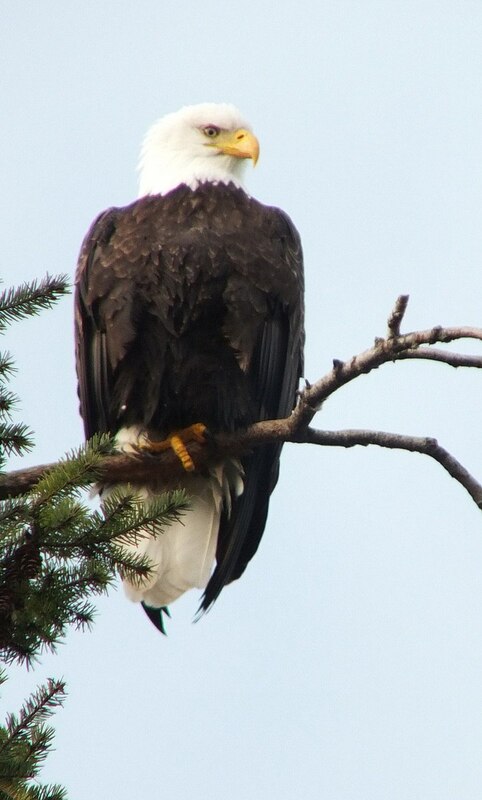 A Bald Eagle is a huge bird with a wingspan between 1.8 and 2.3 metres (5.9 and 7.5 feet). Their body length can be almost 102 centimetres (40 inches), and they can weigh close to 6 kilograms (14 pounds). It is the female Eagle that is the largest of the two. 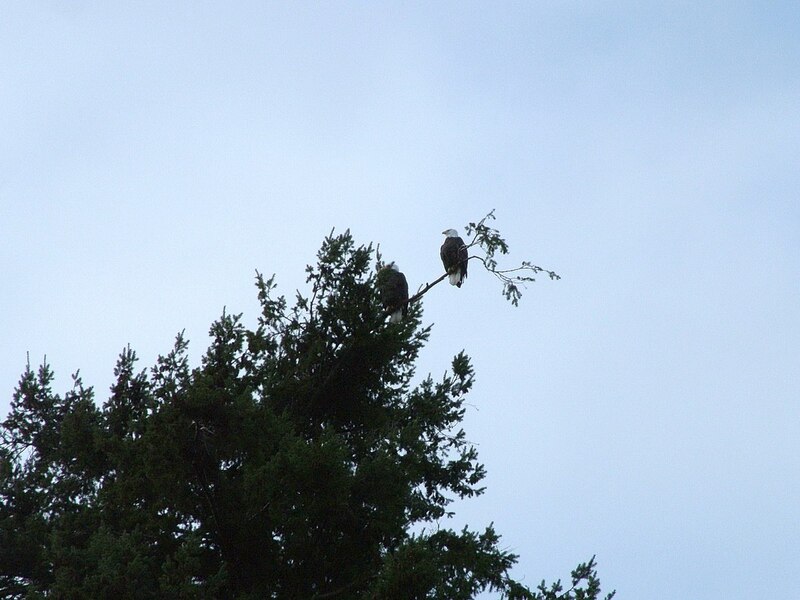 It was quite remarkable to me, as we walked the different trails around Deep Bay, that you could always identify which evergreen trees that the Eagles regularly roost in because the tops of the trees are perpetually in a bent position. The eagles’ nests, however, are built in very large old-growth trees that are quite capable of supporting the weight. 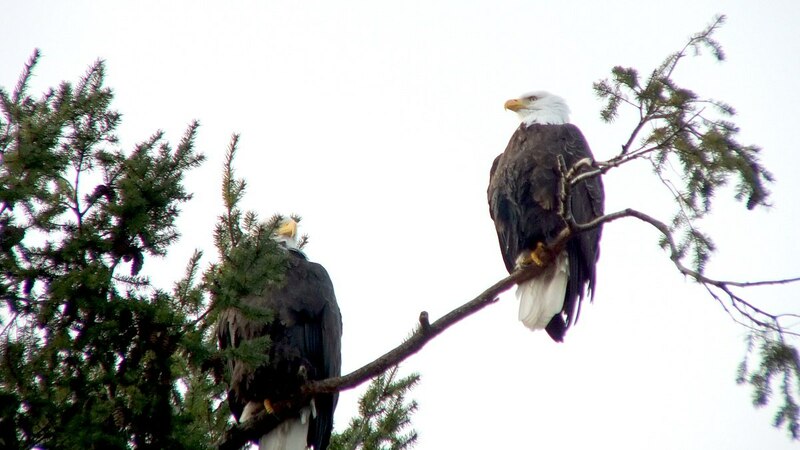 Eagles hold a record for the largest tree nests ever constructed by any animal species. They can achieve a depth of 4 metres (13 feet), a width of 2.5 metres (8.2 feet), and weigh an astonishing metric ton. It is surprising that any tree can hold up under that weight. The three dogs grew impatient as we lingered there below the Eagles’ perch, and finally sauntered further along the roadway. They were anxious to socialize with the neighbours and their canine charges. Bob and I moseyed along, enjoying the fresh sea air while engaging in quiet conversation. We remarked to Claire and Martin just how ideal their home’s location is then proceeded to engage in our own meet and greet with the friendly locals. 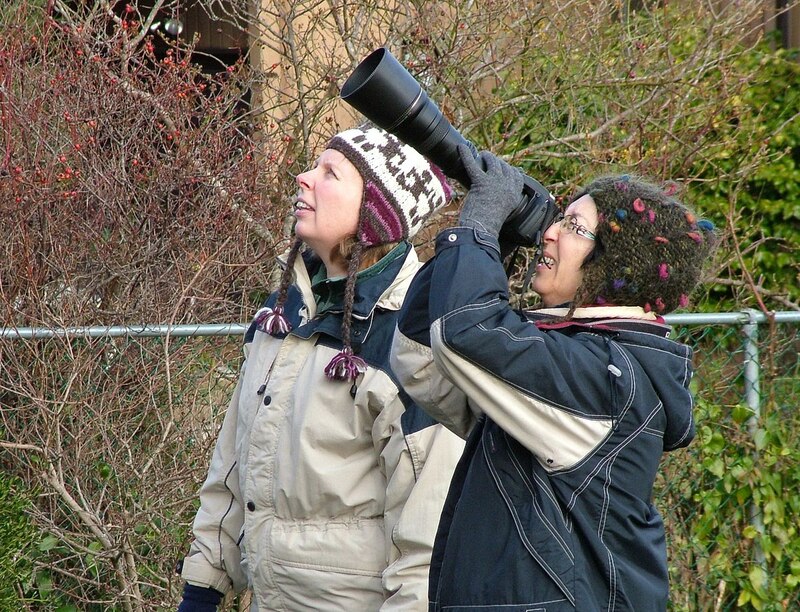 Casting one last backward glance at the Bald Eagles, we acknowledged that it had been a good way to start the day. Juvenile Bald Eagle At Boundary Bay, B.C.